Coffee News® is the most widely distributed restaurant publication in the world and has been hugely successful in helping small and medium sized businesses nationwide create a strong presence in their community for the past 30 years. 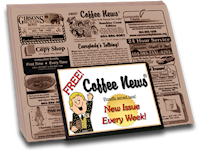 Fresh weekly issues of Coffee News® can now be found in over locations throughout the Bakersfield area communities. We’re very excited to bring this free, weekly publication to local restaurants, coffee shops, hair salons, professional offices, community buildings and other wonderful businesses where people have a few minutes to read good news and fun features while waiting…. Our goal is to be “everywhere” within the community to maximize enjoyment for our readers and exposure for our local advertisers. Everything in Coffee News® is positive and entertaining, including unusual news stories, jokes, trivia, amazing facts, and horoscopes. Be sure to look for the What’s Happening section, which is dedicated to listing local events taking place throughout our community. Coffee News® is one of the most potent, yet affordable advertising publications ever produced. It has grown from a single edition, first published in Winnipeg in 1988, to become the largest franchised restaurant publication in the world. With over 1000 franchises worldwide, Coffee News® is now read by more than ten million people every week! It’s amazing and sustained growth can be attributed to its popular content, accessible distribution, unique design and format which generates BIG RESULTS for the small and medium sized businesses who choose to advertise in Coffee News®. Be a part of Coffee News® and grow your business! For more information contact Bakersfield Coffee News® ! Phone: 661-487-1015 or email us here!